91.5 KRCC's Jake Brownell speaks with Gail and Dan Stuart, whose goats are named for NPR newscasters. Public radio listeners come in all shapes, sizes, and species. Over the years, we've heard from many people who say they like to leave 91.5 KRCC on for their dogs or cats to listen to while they're away at work. 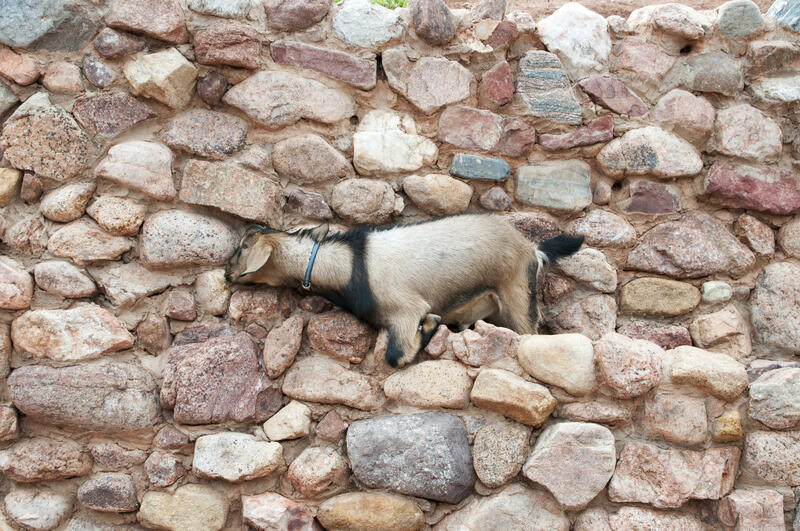 But recently we learned of a new group of loyal quadrupedal listeners right here in Southern Colorado: goats. Steve Inskeep likes to hang out on a stone retaining wall near his enclosure. Gail and Dan Stuart say that, of all the choices on the dial, their goats prefer the balanced, fact-based reporting found on 91.5 KRCC. So each morning, when they head to the barn to milk their five does (female goats), they make a point to turn on Morning Edition. In fact, the Stuarts and their goats are such fans of public radio, when they had a new litter of kids (baby goats) last spring they decided to name each one for a different NPR personality. Thanks to the Stuarts, Scott Simon, Lulu Garcia-Navarro, Audie Cornish, Giles Snyder, Shankar Vedantam, Steve Inskeep, and Ari Shapiro each now have caprine counterparts. Dan Stuart and Giles Snyder share a tender moment. 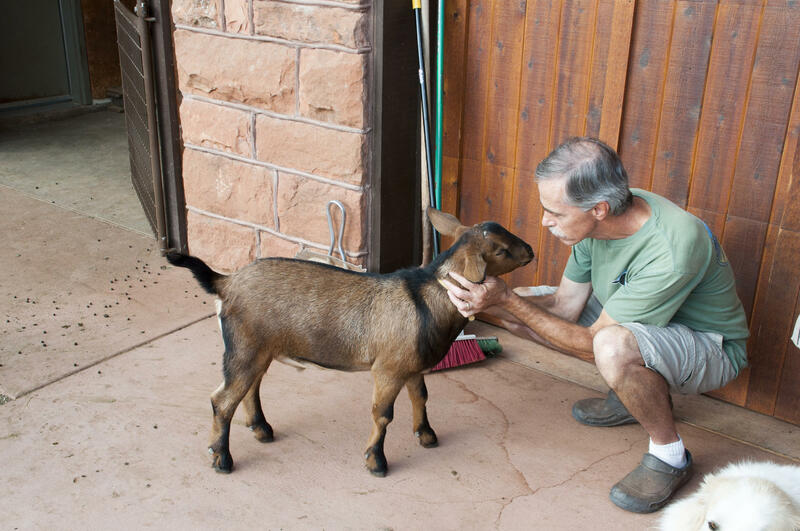 In honor of our ongoing fall membership drive, we paid a visit to the Stuarts' home in Manitou to meet the goats and learn a bit more about how 91.5 KRCC fits into their routine. Audie, Lulu, Ari and Scott recently made their way to new homes, but you can hear Giles, Shankar, and Steve in the audio player above! While you listen, please also consider making a financial contribution to 91.5 KRCC. Member donations make up the largest portion of our revenue, and your dollars are vital to helping us thrive in Southern Colorado. Thank you so much for your support!